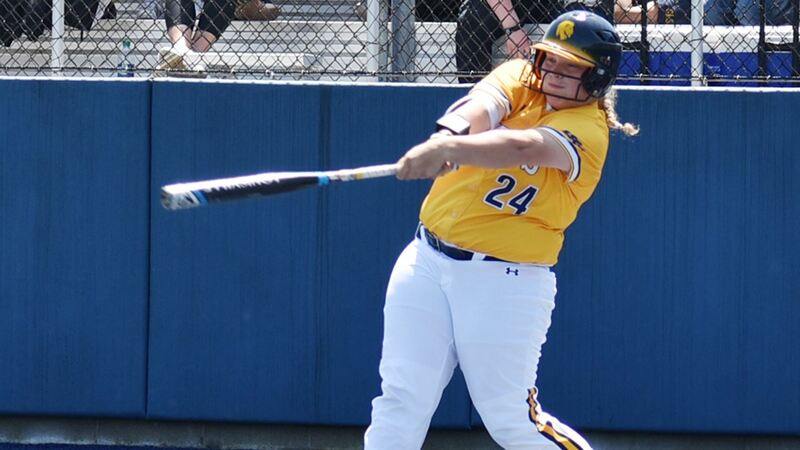 RICHARDSON– Texas A&M University-Commerce catcher Avery Boley has been named the Lone Star Conference Hitter of the Week. The conference office on Tuesday announced the award. It is the first LSC Hitter of the Week award in Boley’s career. She is the third different Lion to be named Hitter of the Week this season. Boley– a freshman from Fort Worth (Nolan Catholic)– delivered for the Lions nearly every time she came to the plate. She hit .714 on the week with a 1.143 slugging percentage, driving in three runs and scoring twice. She had three hits in game one against TWU, including a solo home run and an RBI single. She also had a hit in game two of the series. Boley then had an RBI and a single with a run scored in the final game of the series. During the Lions’ 11-game winning streak, Boley is hitting .478 with a .957 slugging percentage. Boley and the No. 10 Lions have won 11 games in a row and currently sit in second place in the LSC with a 33-9 record and a 19-5 record in conference play. The Lions return to action on Friday as they face No. 23 Tarleton in a three-game series. The first game of the series will be played at 6 p.m. at the Tarleton Softball Complex in Stephenville. Lions and Hartford roar back to take championships at UAFS Hardscrabble Invitational. FORT SMITH, Ark. 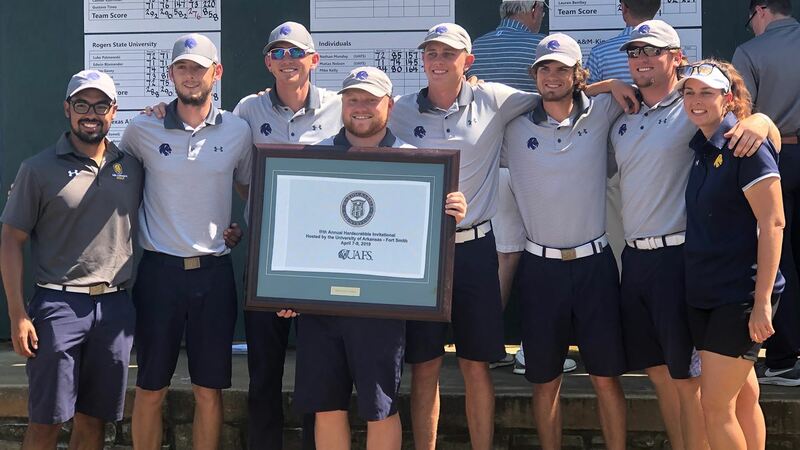 – For the second straight tournament, the Texas A&M University-Commerce men’s golf team executed a third-round comeback, as the Lions and Blake Hartford claimed the championships at the UAFS Hardscrabble Invitational. The Lions made up a nine-stroke deficit and won over Arkansas-Fort Smith by three strokes, shooting 4-under par in Tuesday’s final round. The Lions completed the event at 852 (289-287-276, +12). Hartford (Spring – Klein Collins) made up seven spots on the individual leaderboard to claim his first championship of the season at even par 210. He shot a 3-under par 67 in Tuesday’s final round with five birdies. The effort gives Hartford his first top-five finish and third top 10 finish of the season. Lucas McCubbin (Midland) earned all-tournament honors in fourth place at 212 (72-72-68, +2), shooting a 2-under par round on Tuesday with four birdies. The performance marks his third top-five finish and fourth top 10 placement of the year. Zach Burch (Lubbock – Cooper) tied for 10th at 215 (72-70-73, +5), scattering four birdies through his round Tuesday. Burch earned his third top 10 finish of the season. Garrett Landers (Sulphur Springs) shot even par Tuesday and placed 15th at 217, while Jonathon Welch (League City – Clear Springs) finished in 17th at 218 with a 1-over par round Tuesday. Joe Wolcik (Cleveland – Tarkington) wrapped up his tournament with an even-par round Tuesday. The Lions finished the regular season on a roll, winning their last two tournaments. They will look to take that momentum into the Lone Star Conference Championships on April 22-23 at Diamondback Golf Club in Abilene. Wongsinth and Lions roll to UAFS Hardscrabble Invitational championships. FORT SMITH, Ark. 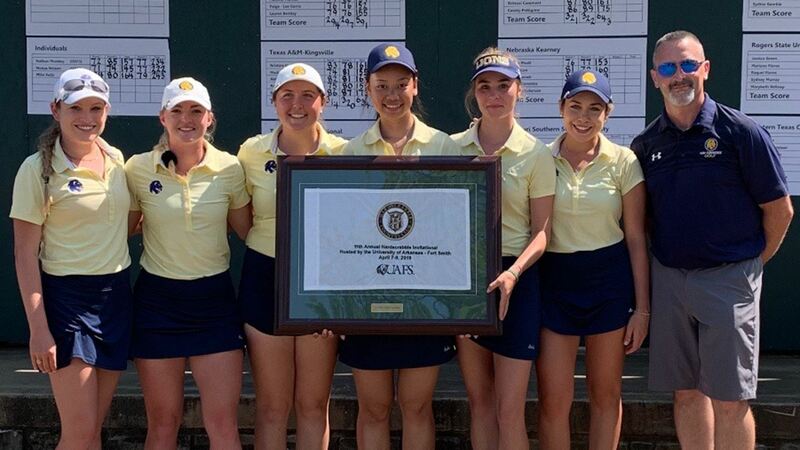 – The Texas A&M University-Commerce women’s golf team closed out the season with a dominant performance, as the Lions and sophomore Sarah Wongsinth claimed the championships at the UAFS Hardscrabble Invitational. The Lions shot 887 (294-297-296, +347) to take a 24-stroke victory over host institution Arkansas-Fort Smith. Wongsinth (Udon Thani, Thailand) earned her first collegiate medalist win, shooting an even-par score of 210 for the 54-hole event to win by three strokes over the second place finisher, and 13 strokes over the third-place finisher. She shot a 1-under par 69 on Tuesday, with four birdies in the round. Wongsinth has now finished in the top five in five of the season’s nine events and the top 10 in eight contests. Sophie-Charlott Hempel (Pirmasens, Germany) earned all-tournament honors, placing third for her first top-five finish and second top 10 finish of the season. She shot a 223 (71-74-78, +13) in the event. Paige-Lee Garris (West Palm Beach, Fla.) earned her fourth top 10 finish of the season, placing 10th on the leaderboard at 228 (76-76-76, +18). Makena Thomas (San Antonio – Reagan) placed 13th at 230, Lauren Leslie (Fair Oaks Ranch – Clear Brook) placed 17th at 234, and Lauren Bentley (League City – Clear Creek) placed 24th at 237. The Lions competed in nine events this season and earned a team championship in at least one game for the third straight year. A&M-Commerce finished in the top five in the team standings of every event in 2018-19. The Lions now turn their attention to the postseason, with the Lone Star Conference Championships held on April 22-23 at the Diamondback Golf Club in Abilene. Texas A&M University-Commerce extends von Rosenberg’s contract through 2022. 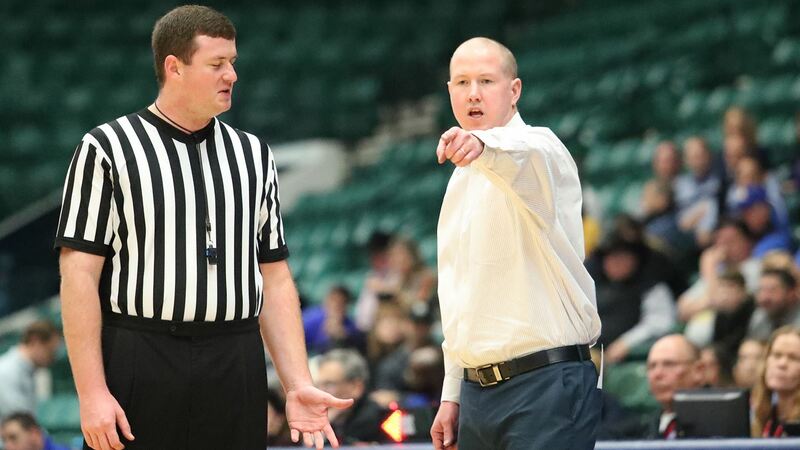 COMMERCE – Texas A&M University-Commerce has announced a multi-year contract extension through the 2021-22 season for head men’s basketball coach Jaret von Rosenberg, effective immediately. von Rosenberg recently completed his second season as the head coach of the Lions, leading the blue and gold to an overall record of 46-18 (.719) and two consecutive trips to the NCAA Division II Tournament’s regional semifinal round. Under von Rosenberg’s tutelage, the Lions have been ranked as high as No. 10 nationally and have been ranked in the NCAA Division II South Central regional rankings in every release. The Lions have had four all-region selections, six all-Lone Star Conference selections, and a participant in the NABC Division II All-Star Game in only two seasons at the helm. von Rosenberg is married to the former Sarah Rasor, and the couple has a son, Jaxon, and a daughter, Ava. Wongsinth and Lions hold commanding leads after the first day at UAFS Hardscrabble Invitational. FORT SMITH, Ark. 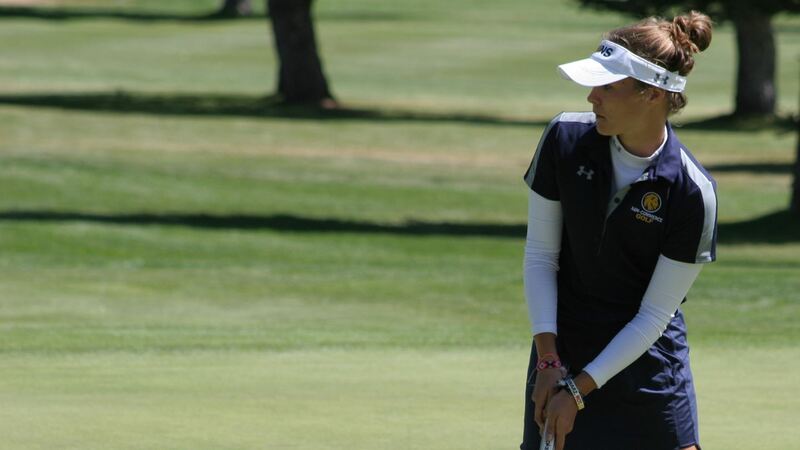 – The Texas A&M University-Commerce women’s golf team is in prime position to close the regular season with trophies, as the Lions and Sarah Wongsinth are in the lead at the UAFS Hardscrabble Invitational. The Lions shot 590 (293-297, +30) in the opening two rounds of the tournament and hold a 20-stroke lead over hosts Arkansas-Fort Smith entering the final 18 holes. Wongsinth (Udon Thani, Thailand) shot 141 (70-71, +1) in the first 36 holes and is one of three Lions in the top five on the individual leaderboard. She had four birdies in the opening round and eagled her 36th hole of the day. Sophie-Charlott Hempel (Pirmasens, Germany) is tied for second at 145 (71-74, +5) with two birdies in the first round and three birdies in the second round. Paige-Lee Garris (West Palm Beach, Fla.) is in fifth place at 151 (75-76, +11) with six total birdies in the day’s action. Lauren Leslie (Fair Oaks Ranch – Clear Brook) is in 10th at 154, Lauren Bentley (League City – Clear Creek) is in 13th at 155, and Makena Thomas (San Antonio – Reagan) is in 19th at 157. The Lions will aim for the tournament title to close the season with 18 holes of action Tuesday. Lions sit third after first 36 holes of UAFS Hardscrabble Invitational. FORT SMITH, Ark. 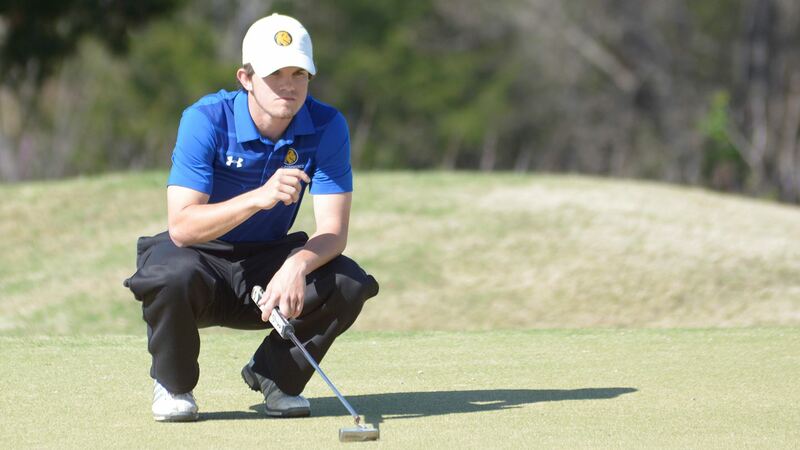 – The Texas A&M University-Commerce men’s golf team is in third place on the leaderboard after 36 holes at the UAFS Hardscrabble Invitational. The Lions are nine strokes off the lead at 576 (289-287, +16), behind Arkansas-Fort Smith and Texas A&M International. Zach Burch (Lubbock – Cooper) is in third place on the individual leaderboard, only two strokes back of the lead. Burch shot 142 (+2, 72-70) in the opening day of action, shooting four birdies in the first round and three in the second round. Blake Hartford (Spring – Klein Collins) is only one stroke behind Burch in eighth place at 143 (+3. 72-71). He also had four birdies in the opening round and three birdies in the second round. Lucas McCubbin (Midland) is in 12th place at 144, shooting matching 72s in each round. Both Garrett Landers (Sulphur Springs) and Jonathon Welch (League City – Clear Springs) shot 147 (+7) and tied for 20th. Joe Wolcik (Cleveland – Tarkington) shot 75 in the opening round before withdrawing in the second. The Lions will look to close the regular season on a high note, completing the tournament with 18 holes Tuesday.